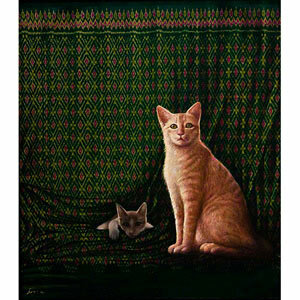 "I love cats and always have had a few of them at home. Taking care of them and having them around is such a relaxing feeling. They are independent and curious animals. No one can force them and they will always do whatever they want to do. I try and convey their independent nature in this work," says Pimon Singhasin. 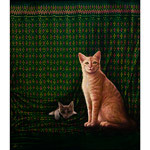 The artist paints the two beautiful felines with acrylics on genuine Thai silk and signs the painting.